OBU915 is a tamper-proof electronic tolling transponder that’s been specifically designed for the road tolling system throughout the São Paulo region of Brazil. Our product designers at EGGS were invited by Q-free to embark on this exciting product design journey, and share the ride with their engineers. Together, we collaborated on everything - from the initial idea and design, all the way to delivering the final production files to the manufacturing plant in São Paulo. Electronic toll collection (ETC) is big business in São Paulo - a sprawling metropolis in the southeast region of Brazil, where millions of vehicles use its tolling system every day. And no one knows road tolling better than Norwegian company Q-free, who specialise in developing global Intelligent Transportation Systems (ITS). Q-free has been supplying the Brazilian market with electronic tolling transponders since 1999, and have delivered over five million to date. In 2014, however, the Brazilian government changed the technology platform for its tolling system from DSRC to RFID. Thus, Q-free had to redesign all their transponders to comply with the updated regulations. Enter OBU915 - a new super-slim transponder that attaches to a vehicle’s windscreen behind the rear-view mirror, unobtrusively blending in with the rest of the interior. Because São Paulo temperatures can soar to 28 degrees Celsius, it was important that the transponder was designed not to overheat. Hence, it’s white to reflect the sun. More uniquely though, it’s completely tamper-proof. If a person breaks into a vehicle and tries to remove it or alter it in any way, the optical switch inside permanently turns the transponder off - rendering it null and void. This is just one of the design requirements EGGS has managed to solve perfectly. 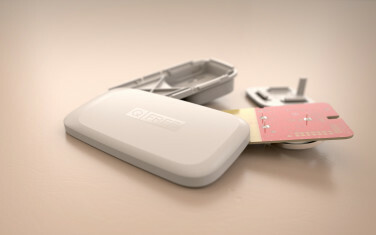 EGGS’ product designers worked closely with Q-free on the precision engineering of each component - including the design of the casing, circuit board and battery. We also helped with testing, fine-tuning and prototyping. EGGS has a great deal of experience when it comes to working with complex ecosystems, so we immediately understood Q-free’s whole São Paulo tolling system and what measures we needed to take to effectively work alongside their engineers. This has resulted in a transponder that’s not only been developed for tolling, but also congestion charging, Automatic Vehicle Identification (AVI), Electronic Registration Identification (ERI) and access control and parking. What’s more it’s designed for high volume, automated, low cost production - another key factor, as imported goods in Brazil face high tariffs. So, OBU915 is being produced at a modern manufacturing plant in São Paulo. Here’s to another five million transponders and counting!